SD note: I once read somewhere that vibrato tells the boys from the men. I didn’t care about this definition at first, but in time, my mind went back to it and I now believe this is accurate. It sounds harsh and snob – and somehow it is, like many things written on the internet – but I see its inner meaning as, it separates the soulful musicians from the others, or it separates the serious musicians from the others, etc. But… Is there a general rule of how a hand-vibrato should sound? Probably not. But it’s easy to spot a vibrato that doesn’t sound good at all (SD note: too fast, too weak – when your hand is not trained or it is fatigued, or going out of pitch, not reaching pitch, for example). What we’ll do here is simply write our thoughts on this subject, to begin with. This article is not meant to be taken as the “only” truth. But it may be taken as a starting point for you to reflect on. Let’s start with the concept of vibrato. When you play a single note on the guitar, it has a certain pitch. Sometimes, by merely holding the string with too much pressure, you can make the pitch go off, making it sound out of tune. Instead, when you pick that note and start to “modulate” it, causing the pitch to go up and down in a rhythmic way, it creates a rather “pleasing” effect to the ear, because you can’t really tell if that note is out of tune, since the pitch is varying all the time, and if the vibrato is being don well, the pitch is varying of musically good, controlled and predictable amounts. Now, with this in mind, we can get a little further. If you ask me (and many others) who is the player wiith the most intense vibrato in Rock and Blues, you would probably get (Angus Young!) as an answer. 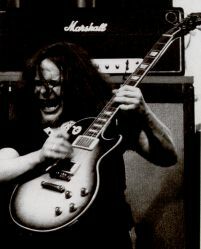 Well… Interestingly enough, Mr. Young’s vibrato actually is the spitting image of one produced by another legendary UK guitarrist: Paul Kossoff, of FREE. If you don’t know him by the name, perhaps the song “All Right Now” might ring a bell. This young man had the most intense and perfect sounding vibrato you can ever image, when he was healthy enough. Please have a listen here: httpv://www.youtube.com/watch?v=xz29Nc4ubz8 httpv://www.youtube.com/watch?v=mFO8KmbTdsc [JP] I spent months trying to figure out how in the world he could do THAT vibrato and, after watching a few live videos, I started to notice important details. Sadly, the short-lived Free didn’t leave many official recordings of their gigs. But what there is out there is enough to show how good they were. (Look for the “Free Forever” DVD. A really fantastic collection). So, now it’s time to watch and learn! Now tell us…. Doesn’t Angus use similar techniques? He also lifts his arm for stronger vibratos, just for a start. When going down with all four fingers, how far down after the bend should one go to get the vibrato? I mean, is it more ”accurate” when trying out Kossoff/Young style of vibrato to go all way down to the position with the fingers as before you bended and how the fingers were placed like and then up and down? Or is it to bend up to the pitch, then go down slightly a bit, up ,down, up, down as the vibrato goes like? I’am not sure really to be honest, it ”seems” more ”powerfull” or ”effective” if i can call it that way, to go all or close to all way down again after the bend and then bending up and making the vibrato that way, just wondering if anyone can answer that. what is accurate? I’am confused really, could it work either way? Hope i explained it good enough. Great article and comments, I have a resonable (not great) non bent vibrato but have allways struggled with the bent note version, and after reading this I have noticed my first action is actually pulling down on the string then “rocking” the string using the neck as a brace. I find this is impossible to do with a bent note, maybe the first action after reaching the bent note should be to be pushing the bent note up further and then release etc has anybody noticed this and overcome the problem? I always tend to lean the low e-string over the binding. Then I figured out bending or vibrating up was better. In general vibratos are very hard, its not about the long vibratos of every riffs end(those are quite easy) but the ones in the middle of things where your fingers might not even have a firm grip around the neck or in the middle of a pentatonic going up and down fast. Great article, Kossof and Young. I wonder if Angus is a big fan of Kossof. Thanks for this, vibrato is a huge empty place for me for the moment, for the life of me I can’t seem to get it ( and bend+ vibrato is on another planet), I’ve googled till I drop but nothing seems to spark off any response in my fretting hand. Classical vibrato I can handle, and even on electric (I’ve got big hands 22cm long wrist to finger tip and a firm grip) but it just don’t cut it when you need something beefier. That’s why I say thanks cos if Kosoff himself took so long to be satisfied with himself then I can wait, knowing that with work it’ll come. Ritchie Blackmore also said that he spent a lot of time developing his vibrato. He once said that he focused mainly on speed and accuracy for a long time. But then he really started developing his vibrato. According to what he said in that interview it took him about three years to develop a technique he was satisfied with. Those three years gave some pretty good results. Thanks for the article and videos, guys, very helpful! Im glad you posted this! I was jamming with a blues guitarist yesterday (He’s Majoring in Music and is amazingly talented) and he was showing my his BB King style vibrato. I certainly agree with you, it is one of those marks of a skilled player. It really takes some talent to keep total control of it. The vibrato at about 2:38 on the last Free video gives me the shivers. Great stuff! Two of my biggest influences there, each with very distinct and famous vibratos. I myself even hold vibrato in the top 5 things a guitarist should have/now. Great article, Kossoff is indeed the king of rock vibrato. I’ve waited for it . Love it! Love this article and I tend to agree on almost everything. I think the most important aspects are shown very well! However, I do not agree on 6.! To me the rate can change and sometimes in order to create a certain effect it has to change. Especially on those building vibratos (5.) both, frequency and amplitude, may start very weak and become stronger more noticeable. I think I did not get the point of that paragraph, or did I? But what I really meant with 6. is that the vibrato should be “steady”. It can vary, but a wide movement followed by a short and another wide wouldn’t sound that great. In other words, it has to follow a “pattern”, or else it will sound out of control. And that photo with Kossoff, isn’t that a Marshall Major? The black/white picture i mean, isn’t the box a little to big for being a ”ordinary” Super Lead?